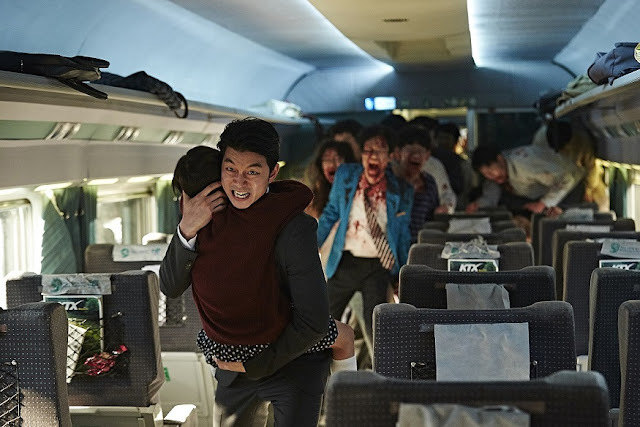 The South Korean made Train to Busan is a film that my best friend was very much looking forward to at the UK Festival of Zombie Culture we attended this past weekend. I had heard plenty of good things about it but I was just not prepared for how amazing it actually was, by far the best film shown at the event, and one of my top horrors of the year. 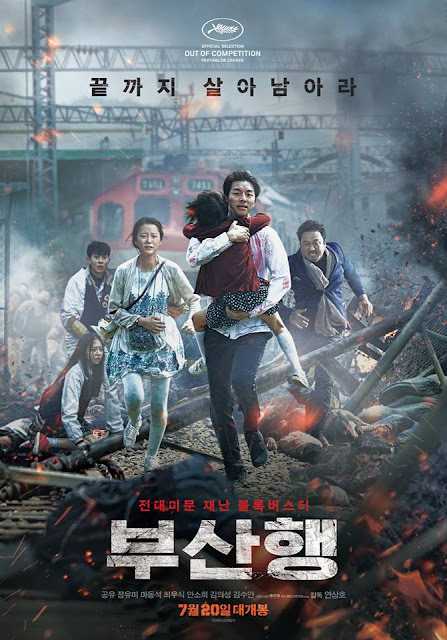 To put it simply Train to Busan is awesome, it is right up there as one of the very best horrors of the year, and is certainly the best zombie film I have had the pleasure to watch in years and years. It is in Korean with English subtitles but they were well translated and there wasn't a point where I felt they distracted aside from when people look at information on their mobile phones. It sets us up with a flawed hero, Seok starts the movie as someone who is only concerned with getting ahead in life, he sees it as pointless to help others, he doesn't even realise how much he is letting his daughter down. Yet during the course of Train to Busan he has quite the arc, steadily changing from someone selfish to someone selfless, taking inspiration from the many sacrifices those around him take to save others. There are some great actors here that shine despite the language barrier, in particular Sang Hwa (Dong-seok Ma) who comes across as a bullying jerk initially, found trying to get his wife to come out of a toilet on the train. This was a false first impression though as his selfless acts and rampant bravery are at odds with his prickly personality, time and time again he shows that behind his brash exterior is someone who actually does care about people, this is wonderfully realised on the screen. It helps that he has some of the coolest action scenes, at one time bashing zombies out of the way with a riot shield he finds, in another awesome scene he grabs one of the undead and brutally throws him upwards into the ceiling of the carriage he is in. Also Soon-an Kim was great seeing as she is just a child, at first I thought she seemed a bit emotionless but by the films end I really came to like her character. The real stars of the film are the undead, never have they seen quite so alien as they do here. Now I am not sure of the effects used to achieve this but the zombies have a strange stop-motion movement, they are all dislocated limbs and contorted bodies that is immensely unnatural. You can tell when a human has turned in the painful way they start moving. I think for a lot of these scenes the frame speed for the film may have been reduced to give the hordes this artificial way of moving, it is stunning to witness. 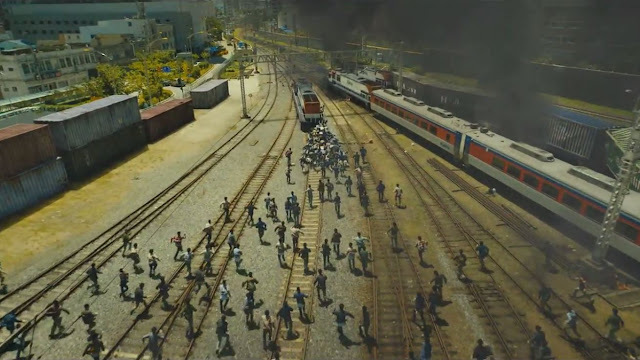 Another amazing thing about these zombies is how they work both as a World War Z inspired moving mass and as individuals. When the undead are together they form almost a wave, with those at the back clambering over those at the front to give a moving wall of rotting flesh that has much better effects than World War Z did with it's sometimes ridiculous looking scenes of mass movement. These zombies all feel so unstoppable, they hammer at windows until they smash, hundreds flowing into rooms like a wave, in one scene some fall off a helicopter, hit the ground at a painful looking angle then immediately get up to attack, at one point around fifty of them are clinging onto the back of a speeding train and each other; they are so freaky and so damn cool in the style chosen for them. These are very much of the running variety which leads to some heart in mouth moments when the survivors find themselves encountering vast groups who fan out like 28 Weeks Later, or pick off the fleeing humans one by one. I at first wondered how zombies on a train would work for a two hour film but there is plenty of variation and twists that even the more sedate parts flow as relentlessly as the ghouls themselves. The manic nature of them is tempered by the fact they only attack if they have line of sight, once they cannot see their prey they go into a sort of semi-coma like state. They are also very poor sighted with them being blind and unable to locate their victims in the dark. The third big negative point to them is that they are not intelligent, they can't use weapons, they can't even figure out how to open doors. This last point leads to a lot of the films middle section where some of the survivors have to work their way through increasingly populated carriages. This part was nearly too over long but with some variation it never outstayed it's welcome. Not so good though is that some of the characters are a bit too stereotypical. In particular we have the middle aged businessman who is almost a projection of who Woo would have become had he carried down his non zombie apocalypse path. This guy is only concerned with his own safety, more than happy to let innocent people die so that he can live. He is a man you love to hate and wish deeply for his inevitable comeuppance but sometimes seems a little too comically evil and self serving, by the films end he is literally picking up people and throwing them at zombies to aid his escape from desperate situations. 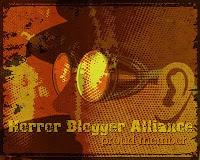 There are lots of action scenes, lots of people being snacked on and lots of gruesome ends to people, some of which are justified and some which are not. At least on three occasions I found myself genuinely gutted that people had not made it, made all the more sad by the same sombre track that starts playing. It leads up to an end where once again my heart was in my mouth, decades of watching zombie flicks had prepared me for the worst outcome. Train station chaos, explosions, baseball bats, soldiers, unstoppable monsters and more all tied together in a film that looks and sounds of the highest quality. 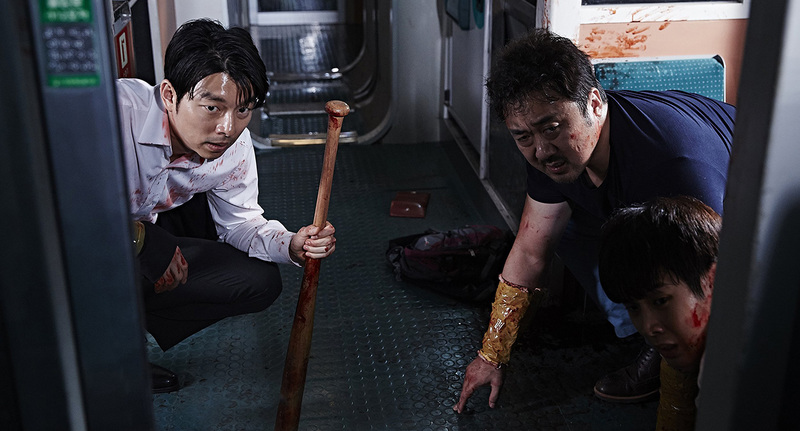 Train to Busan is an essential watch and the most thrilling zombie film to come out for a long, long time, I have already placed my pre-order for the Blu-Ray release due out next February.